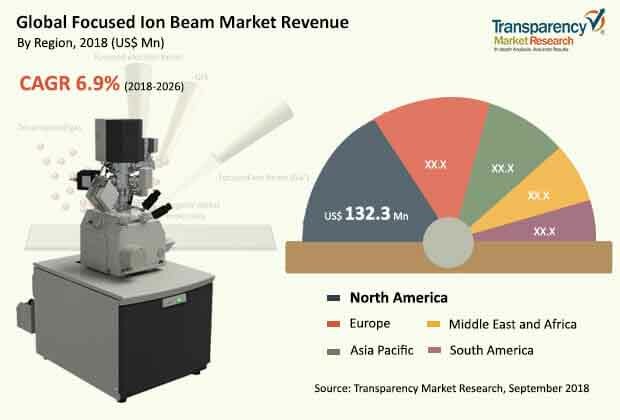 The global focused ion beam market was valued at US$ 399.3 Mn in 2017 and is anticipated to register a stable CAGR of 6.9% during the forecast period 2018 to 2026, according to a new report published by Transparency Market Research (TMR) titled “Focused Ion Beam Market– Global Industry Analysis, Size, Share, Growth, Trends, and Forecast, 2018–2026.” Growing demand for focused ion beam in sample preparation, and rising demand for ion beam lithography and failure analysis equipment has increased the penetration and growth of the focused ion beam market globally. The market in North America is expanding at a significant CAGR of 7.5% on the backdrop of numerous technological innovations in advanced laboratory equipment. The global focused ion beam market by ion sources is segmented broadly into four major segments, namely gallium, gold, iridium, and others (including gas field ionization sources and liquid metal alloy ion sources). In terms of revenue, the gallium ion source was the largest contributor to the market, followed by iridium in 2017. Currently, most of the focused ion beam instruments are equipped with liquid metal ion source (LMIS) with gallium ions. Gallium LMIS focused ion beam technology is preferred due to its long source lifetime, stability, high mass ions for fairly rapid machining, and low melting point. Iridium segment is projected to expand at the highest CAGR of 7.2% over the forecast period. Key trends prevalent in the focused ion beam market are acquisition and partnership, and product innovation. Focused ion beams are increasingly used in the field of material science, both as a microscope and as a specimen preparation tool, thereby increasing the demand for focused ion beam products globally. The adoption of focused ion beam is increasing in various applications such as for determining high-resolution structure, examining mechanical properties, and determining force interactions, all at the nanometer scale. In 2017, the sample preparation segment accounted for the largest market share. Nanofabrication segment is also expected to expand at a significant CAGR throughout the forecast period. Focused ion beam technology is becoming popular in the fabrication of nanoscale structures for different applications. Nanofabrication based on FIB technology involves four major approaches, namely milling, ion-induced deposition, implantation, and ion-assisted etching of materials. Focused ion beam technology complements the entire nanofabrication process by providing various masking techniques or direct patterning. Geographically, the global focused ion beam market is divided into five major geographical regions. These include North America, Europe, Asia Pacific, South America, and Middle East & Africa. In 2017, North America was the topmost revenue generating region followed by Europe.This is mainly attributed to growth in demand for nanofabrication and sample preparation equipment in the U.S. and Canada. The U.S. held highest market share in 2017 in North America and is estimated to expand at a high CAGR during the forecast period.The market in Europe is anticipated to grow at a significant CAGR during the forecast period owing to high penetration of focused ion beam systems in industrial and non-industrial research sectors.The focused ion beam market in Asia Pacific is expected to expand at the highest CAGR of 7.8% over the forecast period. Factors such as growing technological innovations and popularity of conventional biological laboratories and increasing R&D investment are expected to drive the Asia Pacific focused ion beam market. The company profiling of key players in the global focused ion beam market includes company overview, major business strategies adopted, SWOT analysis, and market revenues for years 2015 to 2017. The key players profiled in the global focused ion beam market report includes Hitachi High-Technologies Corporation, Thermo Fisher Scientific, Evans Analytical Group, Carl Zeiss AG, Fibics Incorporated, Tescan Orsay Holding A.S., Raith GmbH, JEOL Ltd., Nanosurf AG, and zeroK NanoTech.Various players are introducing technologically advanced focused ion beams and establishing partnerships with other players to meet the continuously growing demand for accurate nano scale measurements.